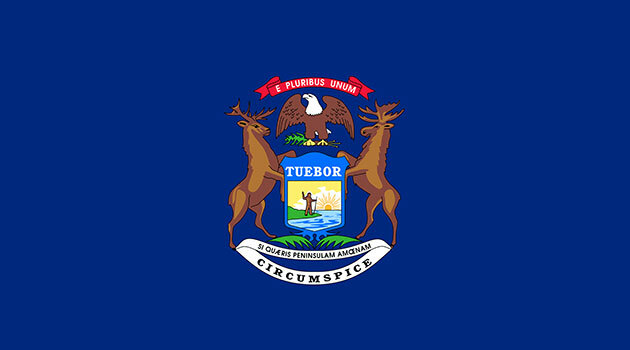 re-use, titled MIFlag Caption—A federal judge in Michigan blocked state officials from suspending driver's licenses for unpaid tickets, saying it unfairly punished poor Michiganders. Michigan is currently one of 39 states that will suspend a driver’s license for unpaid court fees. However, on December 14, 2017, U.S. District Judge Linda Parker issued a preliminary injunction blocking the State of Michigan from suspending driver’s licenses for people who say they can’t afford to pay traffic fines. The first-of-its-kind decision could restore the driving privileges of up to 100,000 Michiganders and prevent numerous license suspensions in the future. Judge Parker’s action was in response to a May 2017 lawsuit filed by Equal Justice Under Law, a civil rights advocacy non-profit. There is “a strong likelihood that plaintiffs will show that the law violates procedural due process,” Parker said. Additionally, Michigan is said to be one of the harshest states in the country when it comes to license suspensions over court fees, reported the Detroit Free Press. License suspensions in the state are non-discretionary, usually indefinite, and applied to all citizens, regardless of their crime or ability to pay off their debt. State officials, however, believe Michigan’s traffic safety laws “are applied equally to all drivers,” according to Secretary of State spokesman Fred Woodhams. Parker hopes to bridge the divide between state officials and ticketed motorists by giving those at risk of losing their driving privileges a chance to plead their case in a pre-revocation hearing before a potential license suspension occurs. A future trial date has not yet been released, but it is expected in order to determine whether or not the state will permanently end the suspension practice.